Wesley Heights was Charlotte’s first Historic District located on the Westside. Wesley Heights retains an amazing degree of its original character. The neighborhood was developed primarily in the 1920′s on the nineteenth-century farm of Charlotte livery stable owner John Wadsworth . It involved some of the same interests responsible for the creation of the Elizabeth and Eastover neighborhoods in Charlotte. Wesley Heights has survived some dramatic changes in its history, and yet still appears much like it did when it was served by Charlotte’s streetcar system. 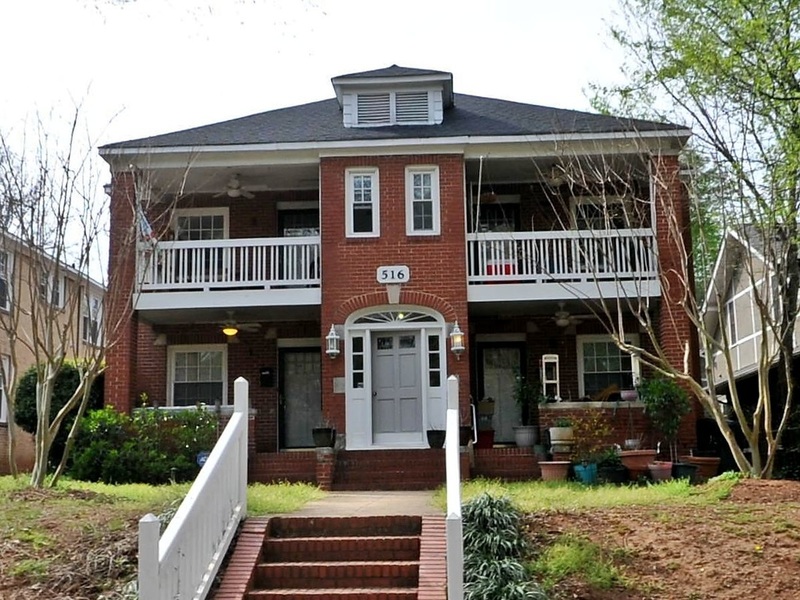 Wesley Heights was close to two trolley lines in the early days of streetcar neighborhoods and is an intact example of an early twentieth century community with pleasing architectural integrity and character. ​The neighborhood’s Bungalow style homes and tree canopied streets compliment the involvement of Wesley Height’s residents, whose efforts led to the listing of the area on the National Register of Historic Places in 1994. 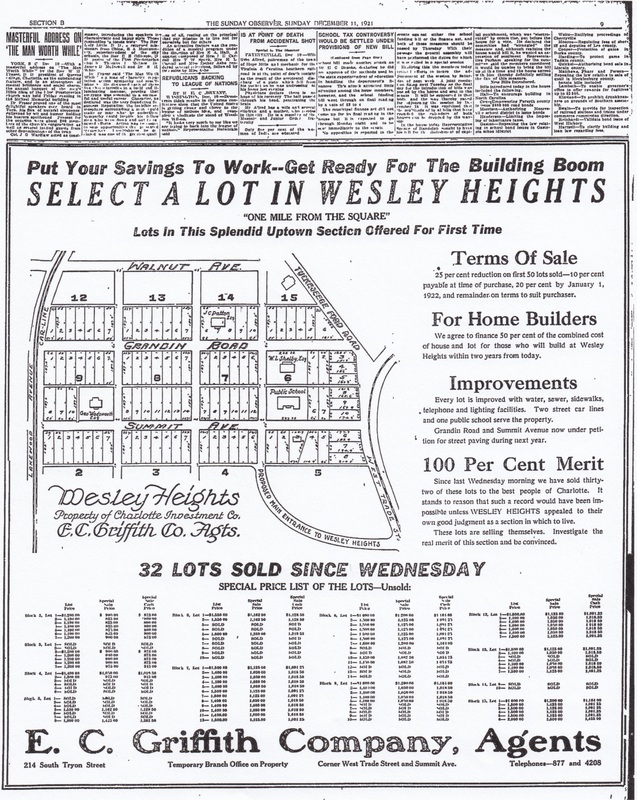 Wesley Heights is a diverse community and has been for a very long time. 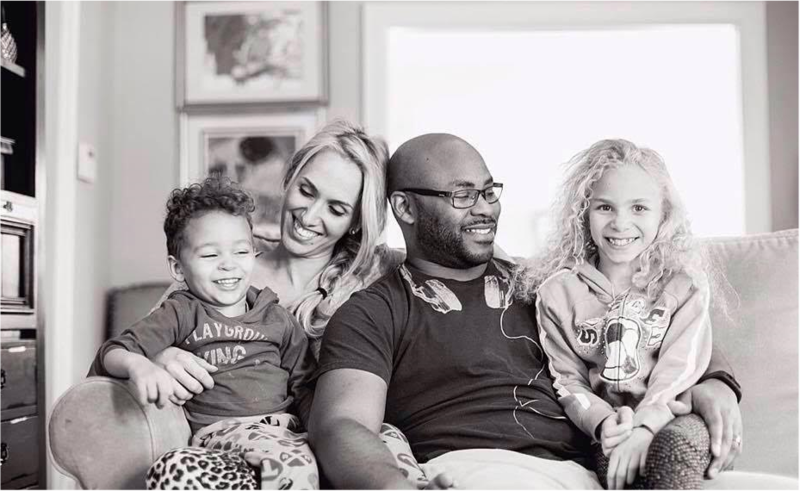 Our community prides itself for the level of inclusion and acceptance of all people regardless of their background. Wesley Heights residents take great pride in the community and continue to make it one of the best in the City of Charlotte. Not only do we have a great proximity to extensive greenways....we are just steps away from Uptown Charlotte. There is an abundance of things to do within a 3 mile radius of our community. If you need to get out of town for a while we are located right in the middle of two major interstate systems, I-77 and I-85 making a road trip quick and simple from our doorsteps. Wesley Heights is an early twentieth century streetcar suburb of Charlotte, North Carolina. It is located approximately one mile northwest of "the square" (the intersection of Trade and Tryon Streets), which is commonly considered to be the center of town. Streets generally follow a grid pattern, with the principal streets running northeast to southwest. 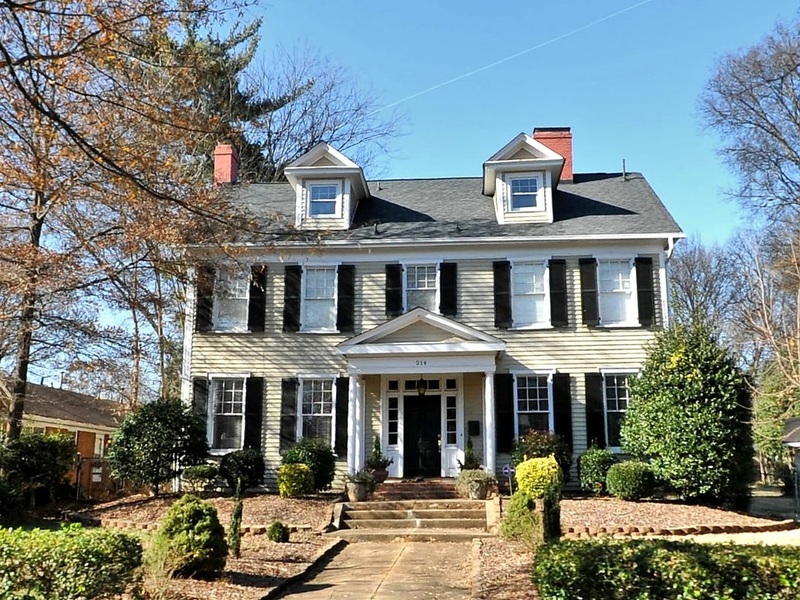 Although the neighborhood is easily accessed by industrial/commercial W. Morehead Street and Freedom Drive, the character of Wesley Heights is entirely residential. Interstate 77 skirts the eastern edge of the district, thereby providing a barrier between Wesley Heights and "uptown" Charlotte. Originally farmland, the terrain of gently rolling hills is typical of the North Carolina Piedmont. Improvements were undoubtedly made during the early phase of development which probably altered the natural terrain somewhat. Nonetheless, the sloping topography remains evident on the landscape. Brick and cinderblock retaining walls, many of which are original, line the streetscapes throughout the neighborhood. Mature trees stand guard over the sidewalks and granite curbstones which edge the roadways. Wesley Heights is an impressively coherent district . With the exception of houses removed for road building projects, and the destruction of the public school, very few buildings have been torn down. Virtually all of the non-contributing structures are infill construction on lots previously undeveloped. There are a total of 372 buildings, 335 (ninety percent) of which are contributing resources. Of the 372, there are two churches, 287 residences, eighty-two garages, and one backyard workshop. The residences can be further broken down into single-family houses (225) and multi-family dwellings (sixty-two). Multi-family dwellings are of three types: duplexes, quadriplexes (two-story, four-unit apartment buildings), and apartment buildings. There are seven apartment buildings, eleven quadriplexes and forty-four duplexes. The neighborhood was first laid out in 1911. At least one house dates from this period, the George Wadsworth House at 400 S. Summit Avenue (no. 123). 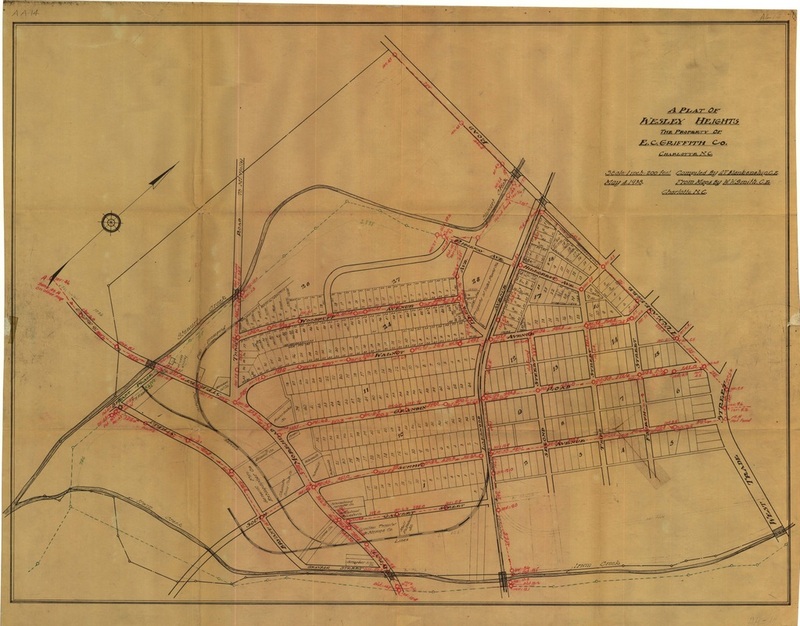 In 1920, the land (excepting the few lots already sold), was transferred to the Charlotte Investment Company, who re-drew the survey plat, improved the land and offered lots for sale in December of 1921. Initial sales were brisk, and houses were constructed beginning in 1922. The majority of resources were built between 1922 and the close of the decade. Most of the remaining houses date from the 1930s, with a scattering of homes built during the 1940s and later. 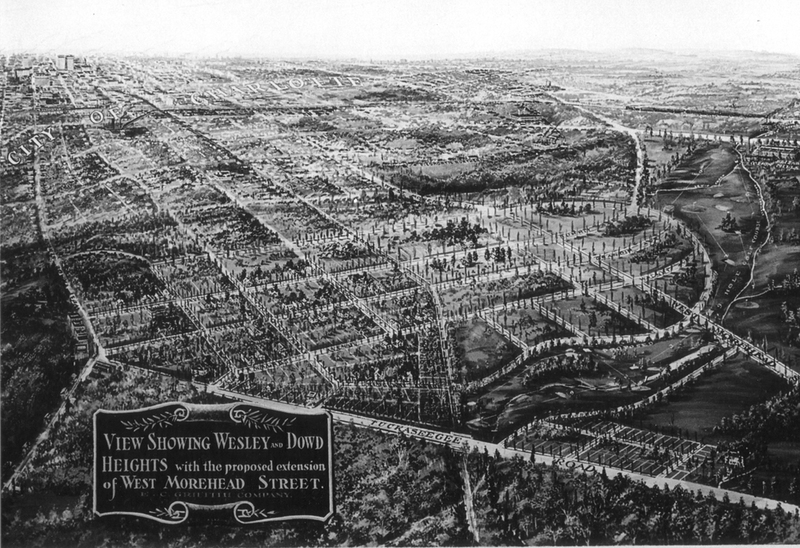 Integral to the layout of Wesley Heights was the proximity to rail lines. There was already a functioning streetcar line running up W. Trade Street and bordering the southeast corner of the tract. Additionally, the Piedmont and Northern Railroad had a track running directly through the center of the neighborhood. The Piedmont and Northern connected a string of textile mills in Mecklenburg and Gaston counties, but did not have a stop in Wesley Heights. Lots are long and narrow--typical for an urban setting. Most lots are fifty-five feet wide and either 150 or 187 feet long. Virtually all of the houses are set back from the sidewalk, but two houses on Walnut Avenue (no. 166 and no. 234) were constructed on the extreme rear portions of their lots. Most of the lots have driveways and many have, or had, garages behind the houses. Functioning alleyways transect the rear lot lines in most of the older section (northeast of the former Piedmont and Northern Railroad tracks). Only nine dwellings face side streets, the rest face the principal northeast--southwest streets. Building materials are overwhelmingly wood and brick (veneer). Other types of masonry, namely stucco and stone trim, are seen on only a few buildings. The Wesley Heights Methodist Episcopal Church located at 201 Grandin Road (now Greater Bethel A. M. E. Church) has marbled glass windows and was designed by the famed Louis Asbury Architect. Some modern replacement materials are also present, especially asbestos and vinyl siding. The predominant architectural styles are Bungalow/Craftsman, Tudor Revival and Colonial Revival. While both churches and a handful of houses are architect designed, the majority were not. They were likely constructed following published or purchased plans. Several do not embody any overwhelming style characteristics and could be termed vernacular. 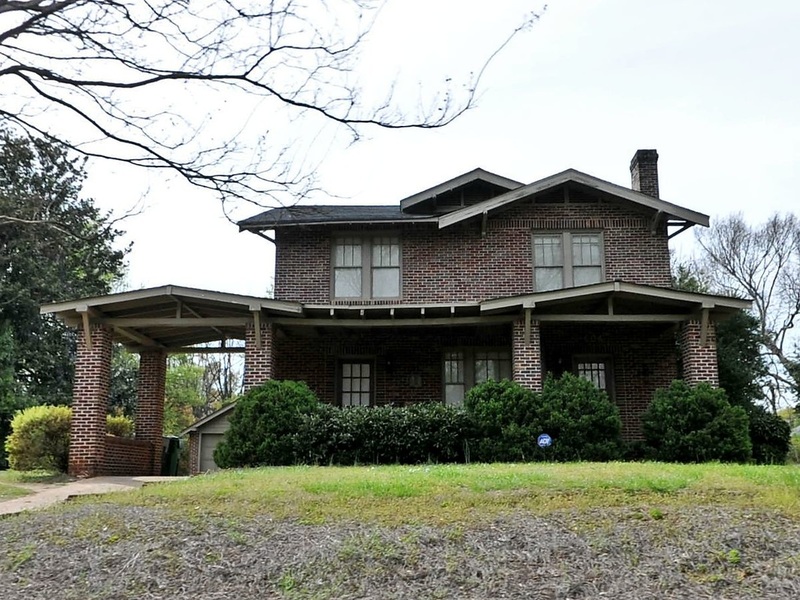 A few prominent Charlotte architects were known to have designed buildings in Wesley Heights. Louis Asbury drew the plans for both the Wadsworth House at 400 S. Summit Avenue (no. 123) and the Greater Bethel African Methodist Episcopal Church (formerly Wesley Heights Methodist Episcopal Church) at 201 Grandin Road (no. 10). The other church in the neighborhood, St. Mark's Baptist Church (formerly St. Andrew's Episcopal Church) at 615 Grandin Road (no. 61) was designed by William H. Peeps. 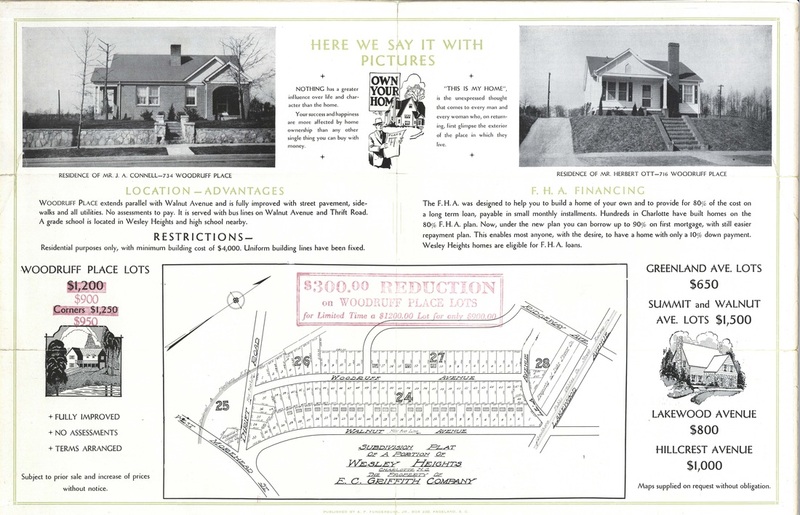 Fred L. Bonfoey was a Charlotte architect who had established a reputation for designing bungalows, and is known to have drawn plans for houses in Dilworth, also worked in Wesley Heights. An example of his work can be seen in the Severs House at 321 Grandin Road (no. 30). While there are a few houses that were designed by architects, the vast majority were erected by builders using what was listed on building permits as "private plans." These were either purchased or published plans which were then widely available at low cost. Scholars have pointed out that the cost of mechanical systems, which were considered mandatory by the 1920s, increased expenditures, and could be accountable for twenty-five percent, or more, of a building's total cost (Clark, p. 162; Wright, p. 168). Economies had to be found elsewhere. One such economy was in using stock plans rather than the services of an architect. Twenty-two builders were listed in the 1920 Charlotte City Directory. In 1930, there were seventy-one. This represents a 323 percent increase in only a decade. Many of these names appear on building permits in Wesley Heights. Out of town builders, and builders not mentioned in the City Directories were also employed. Consequently, no one contractor dominated the market in Wesley Heights. Additionally, building permits were found which were signed either by a developer, or by the owner himself. Whether architect-designed, or derived from a purchased plan, the bulk of the housing stock in Wesley Heights can be classified according to general style groups. 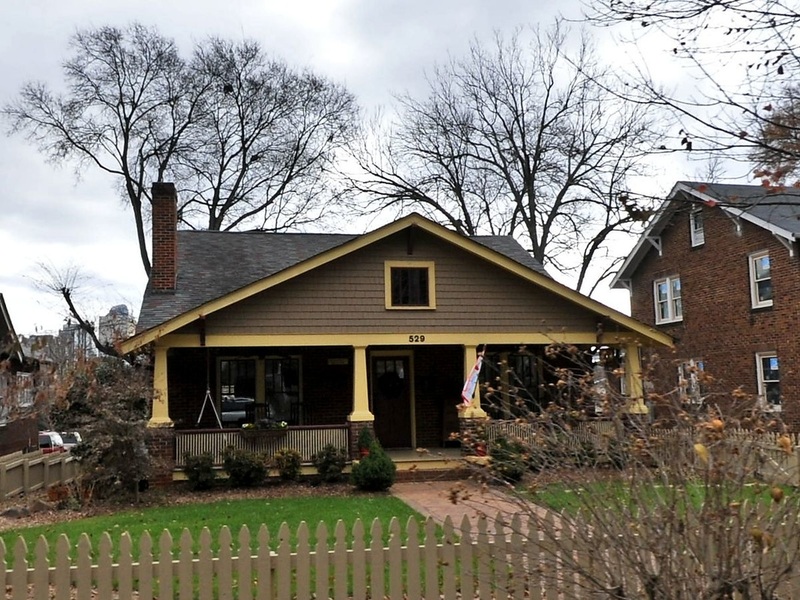 They fall into three primary categories: Bungalow/Craftsman, Colonial Revival and Tudor Revival. The most prevalent style, hallmarks of this style are broad, low-pitched roofs, vertical-light windows, porch supports that combine brick piers with wood posts or columns, and wide overhanging eaves accented by knee braces and exposed r a f t e r ends. Houses with Bungalow and/or Craftsman detailing can be further broken down by type. Front-gabled bungalows are one or one and one-half stories in height, and show their gable end to the street. Many are basic rectangular boxes. Others incorporate protruding bays or gabled extensions to the sides. All have porches. Different effects can be produced, depending on the size and orientation of the porch roof. Afull-width front-gabled porch often mimics the roofline of the house and dominates the facade. Both the Cleveland House at 221 Grandin Road (no. 19} and the Goodman House at 420 Grandin Road (no. 43), have this effect. A full-width porch with a hipped roof, however, is clearly subordinate to the house. This can be seen on the Parker House at 400 Grandin Road (no. 33). Some plans called for a hip-roofed porch to wrap across a portion of the facade and down part of the side elevation. This arrangement helps ameliorate the angularity of the form and is found on the Abernethy House at 100 Grandin Road (no. 1). Side-gabled bungalows are common also. Having the gable end perpendicular to the street, these houses often are dominated by massive full-width porches. The porches are either attached or engaged. The Taylor House at 401 Grandin Road (no. 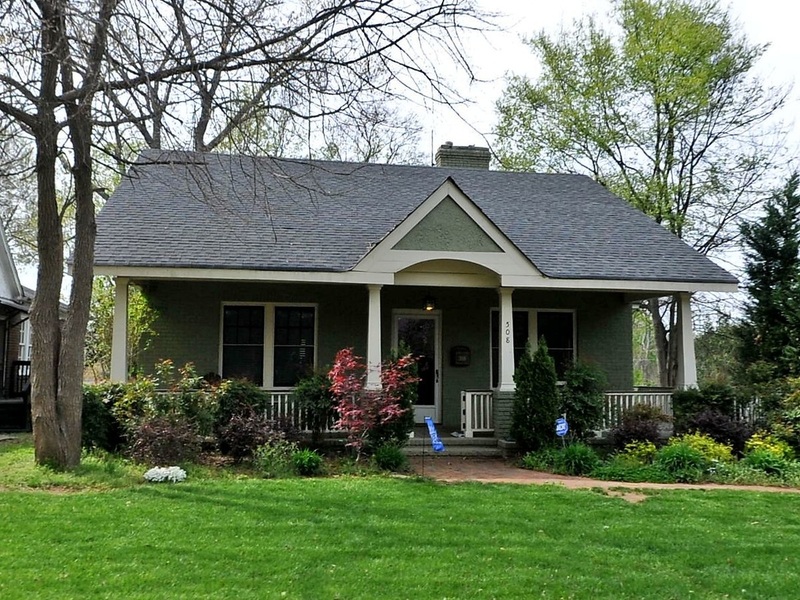 34) is a particularly nice example of the type with an attached side-gabled porch. Both the house at 408 Walnut Avenue (no. 37) and the Miller House at 130 Grandin Road (no. 8) are so similar to the Taylor House, that they were probably all built following the same plan. Dormers are used to punctuate the solid surface of the roof. Bungalows with combination roofs use both parallel and perpendicular ridgelines in the same roof structure. On this type, the house is front-gabled, but transected by a side-facing gable which covers the porch and a portion of the facade. The house at 325 Walnut Avenue (no. 169) is a clear illustration of this type. Some, like the Smith house at 209 s. Summit Avenue (no. 105}, have partially recessed facades under the side-gabled roof. Hipped bungalows are less prevalent. Most have roofs that extend out and incorporate the porch under the same roof structure. Some have dormers on the front or cross gables on the sides. Some good examples are the Todd House at 412 Grandin Road (no. 39), the Sherrad House at 316 S. Summit Avenue (no. 117), and the lewis House at 420 Walnut Avenue (no. 179). 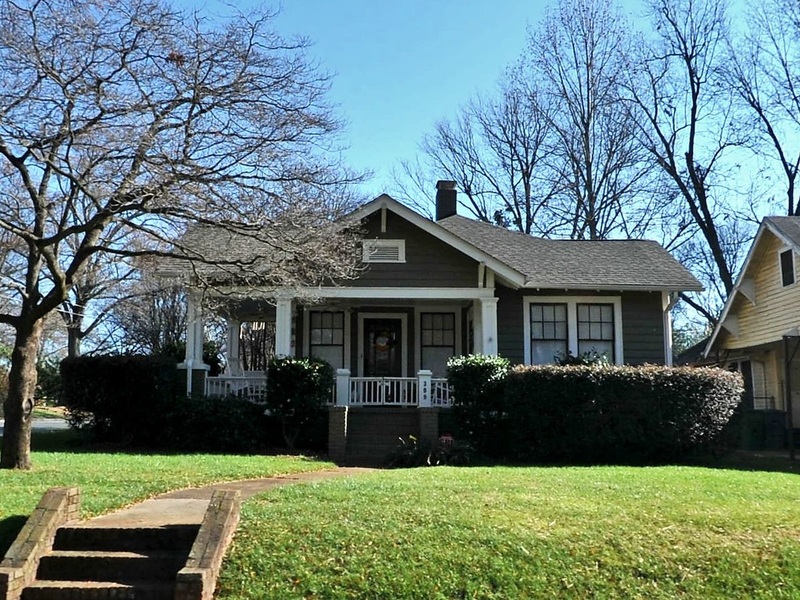 Bungalow/Craftsman detailing was also employed on duplexes in Wesley Heights. Several duplexes have front-gabled roofs and pairs of matching front-gabled porches. 308-10 S. Summit Avenue (no. 113) illustrates this in weatherboarded frame, and 712-14 Grandin Road (no. 77) is a similar structure in brick veneer. A variation with clipped gables is found in 309-11 Grandin Road (no. 24). The Colonial Revival style was popular and long-lived throughout the nation during the early twentieth century. Hallmarks of the style include symmetrical facades, side-gabled roofs, end chimneys, and multi-paned sash windows. The most notable Colonial Revival style house in Wesley Heights is the two and one-half story Watt House at 214 Grandin Road (no. 16). It was built on a parcel spanning three lots and is shown on a 1921 plat. It was probably designed by an architect and is a fine example of the style. Other Colonial Revival houses include the Beatty-Oxner House at 704 Grandin Road (no. 73) and the Kistler House at 724 Grandin Road (no. 82). While the ''Tudor Revival" style was being grand, elaborate mansions that come to mind when one hears are not present in Wesley Heights, a diluted version of the b u i l t during the 1930s. Called "Period Cottages," these houses employ elements of the style such as front-facing cross gables, exterior front chimneys, and the absence of front porches. Most are brick veneer and all are one or one and one-half stories in height. Good examples of this style are the Goodman-Liston House at 416 Heathcliff Street (no. 88), the Coppala House at 620 Grandin Road (no. 64) and the house at 805 Walnut Avenue (no. 230). 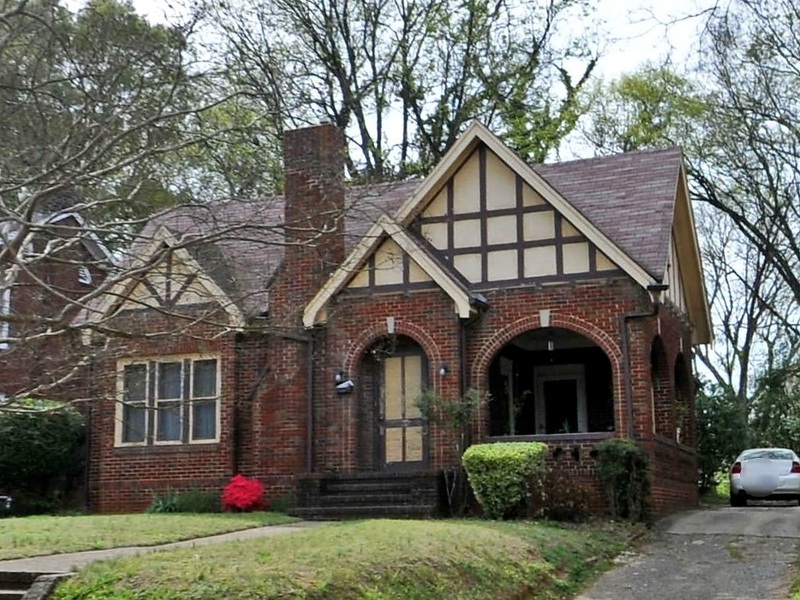 This "Period Cottage" version of the Tudor Revival is also used on duplexes in Wesley Heights during the 1930s and early 1940s. Most of the duplexes built in this entrance to the second recessed corner porch. By doing this, the duplexes are made to resemble single-family dwellings. Good examples of this type are found at 624-26 Walnut Avenue (no. 211), 709-11 Walnut Avenue (No 218), and 728-30 Woodruff Place (no. 273). 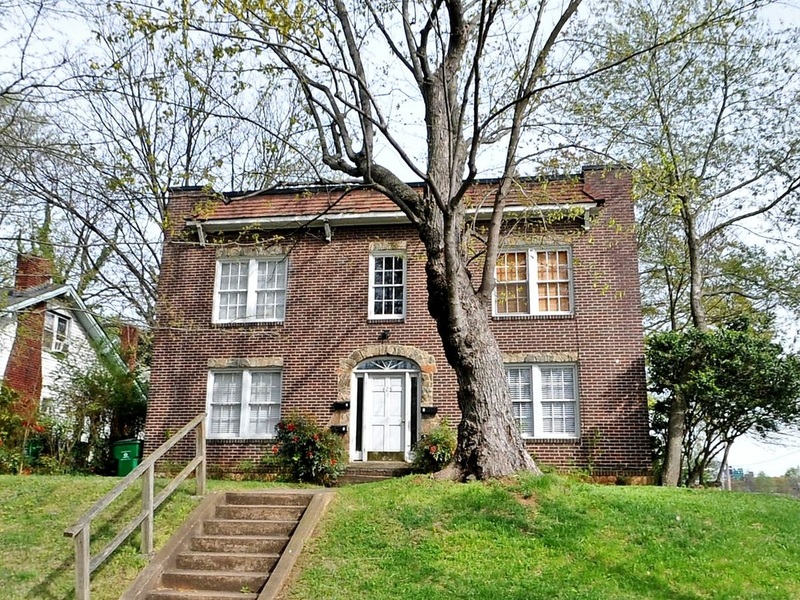 Four-unit "Quadriplexes," which were popular in Charlotte during the 1920s and 1930s, are prevalent in Wesley Heights. They were probably successful because they allowed four units to be built on a standard size building lot, and yet harmonized with the character of the single-family residences lining the street. Although the decorative details were varied, they were all built following a standard format--two apartments on each of two floors. Acommon central entry serves all four units, and all four units have front porches or balconies. In some quadriplexes, the entry bays protrude out so they are flush with the porches. A t r i o of buildings like this were built on Walnut Avenue in 1928, at Nos. 524, 600 and 604 (Inventory nos. 198, 200 and 201). 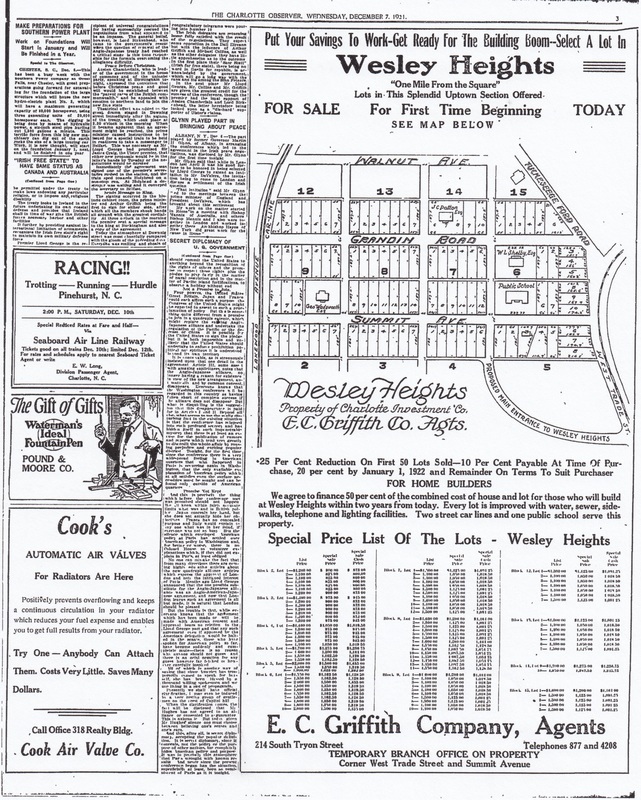 There are two apartment buildings in Wesley Heights dating from the period of significance. The Bomar Apartments at 305 S. Summit Avenue (no. 112) were designed and b u i l t in 1928 by the Graham Brothers. I t has elements of the Spanish Mission style, such as a tiled roof and round-arched openings, but is basically an extension of the quadriplex format. It has four units on each of two floors, with a center hallway in between. The Catawba Apartments at 107 Grandin Road (no. 2), designed by Louis Asbury, has twelve units inside (four on each of three floors) and a center hall, similar to the Bomar Apartments. 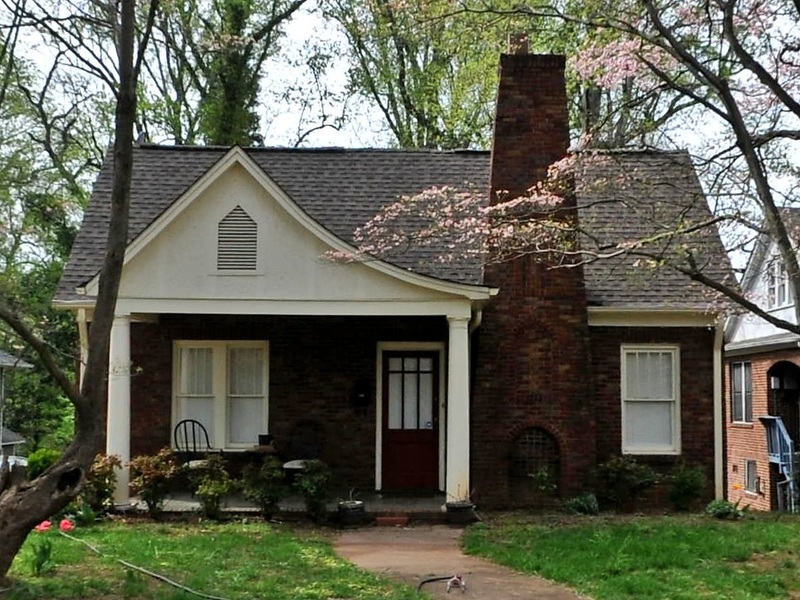 The Catawba, however, lacks the porches and stylistic detailing of the Bomar Apartments. The Wadsworth House a t 400 S. Summit Avenue (no. 123) was the first house built in Wesley Heights. It was designed by Louis Asbury and built in 1911, the same year that the first survey plat was drawn. Albeit a late usage of the grammar, the Wadsworth House exhibits elements of the Shingle Style vocabulary. Most commanding is the use of shingles as exterior cladding. The square solid massing, hipped roof with hipped dormers, and multi-paned windows are all suggestive of the style. It was, and remains, the showpiece of the neighborhood. Across 2nd Street, the Robinson-Means House at 326 s. Summit Avenue (no. 122) is the only Four Square-style house in the neighborhood. While alterations are inevitable over time, the integrity of historic fabric in Wesley Heights is very good. Common alterations include the application of vinyl siding, the substitution of wrought-iron porch supports for the original wood members, and the enclosing of porches. In a few cases, windows have been replaced. Generally, the present condition of the buildings is very good, good or fair. Several garages however, are actively deteriorating. Occupancy rates remain high, as this is still a desirable place to live. The present condition of the neighborhood is not unlike its original appearance. The scale, setting, style and materials all remain largely unchanged. Download the entire Historic District document here.